The picture accompanying this blog is from a “poem” that I wrote over ten years ago. 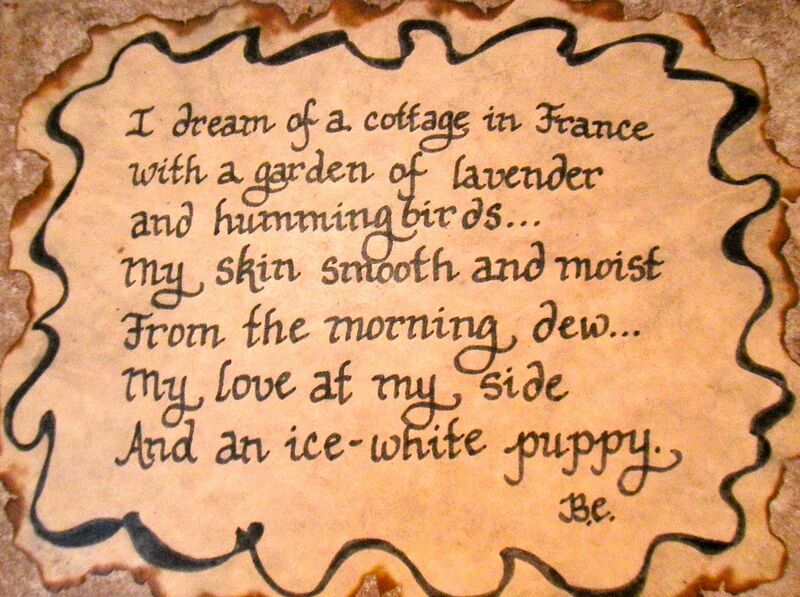 I purchased an inexpensive plague from a craft store and wrote the passage on a piece of parchment paper. I then burned the edges of the paper, glued it on the wooden plague and shellacked it. I’ve carried this around with me (I’ve moved about six or so times since then) and always hung it a wall where I could look at it regularly, wherever I’ve landed. This was before I met my husband (as revealed by the initials that represented my maiden name). What’s my point to this? I think if we place reminders, motivational sayings, beautiful pictures or objects within our line of vision when we sit down to write/paint/create anything, it inspires us. It keeps our dreams alive and helps us to remember why we keep trying to obtain them, despite any obstacles or naysayers, we keep those dreams at the forefront of our psyche, in our mind’s eye and in our hearts. That little plague has much truth to it now; I have my love at my side, I have not one, but two “ice-white puppies,” and I live in a cottage of sorts with two large bushes of lavender near my front door. The France thing, well, I’m still working on that. What reminders, inspirational objects and objet d’arts do you have near you that inspires you to write and/or create? Share them in the comments section below and here’s to realizing your dreams. :). « I’ve Been Tagged — Now You’re It! that is a way to keep the mind poaitive while trying to write I think a good mindset is very important. I don’t do anything similar, but I think anything that keeps the focus positive is good. I think writers should avoid pessimism! Matt– thanks for the comment. Positivity is key (unless a character you’re writing about is a downer), then I guess one has to get into that pessimistic mood to tap into that mindset. :). I happened upon this blog today and find it very befitting. Not only have I begun to create a space of inspiration for my creative side, but I have also started my blog today. Luckily I live in a place which inspires me daily. 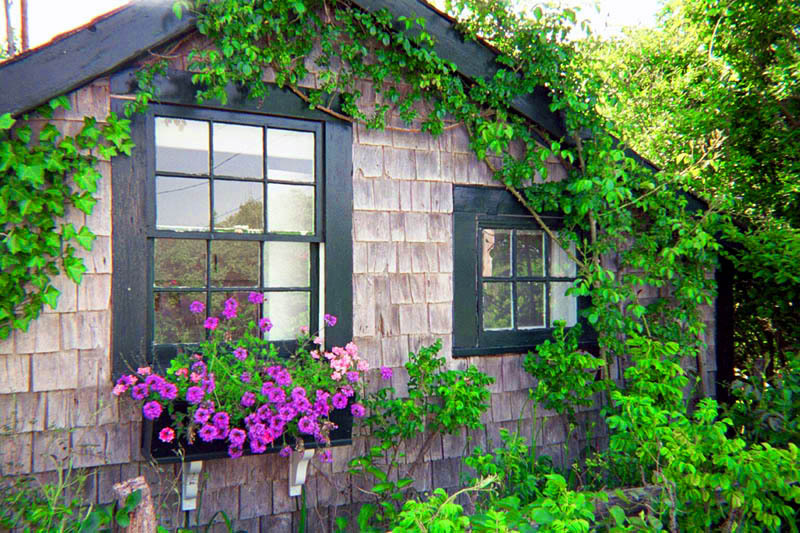 I have my own little stone cottage with various flowers around it. Some I have planted and others were planted by my grandmother. I think writing down ones goals sets them in motion and brings you closer to achieving it. Thank you for the short and inspirational blog today. Hello! And thank you for stopping by and your very nice comments. Nature is always wonderful inspiration and I’m so glad you appreciate my brief musings today. Many good thoughts and great inspiration to you as you begin your blog and hope you’ll stop in again. I read this ages ago Brigette but my iphone wouldn’t let me comment for some reason…but it stayed with me…because it resonated with me due to the fact I dream of living in Italy…France…Spain…in that order…at least part of the year. Perhaps we could be neighbours. Ha! Wouldn’t that be a nice surprise! Thanks, Aileen. I think that’s what was going on at the time…:). This piece reminded me of my many holidays in France. Have had thoughts of living there but like you I’m working on it! A very inspirational land and one I return to over again in my mind. Haven’t been for a couple of years so must return maybe next year. Refresh my memory! Lucky you! That’s my dream. Hope you’ll blog about those wonderful memories and glad to know it’s as beautiful as I’m imagining. Thanks so much for your lovely comment and hope you’ll visit again. :).